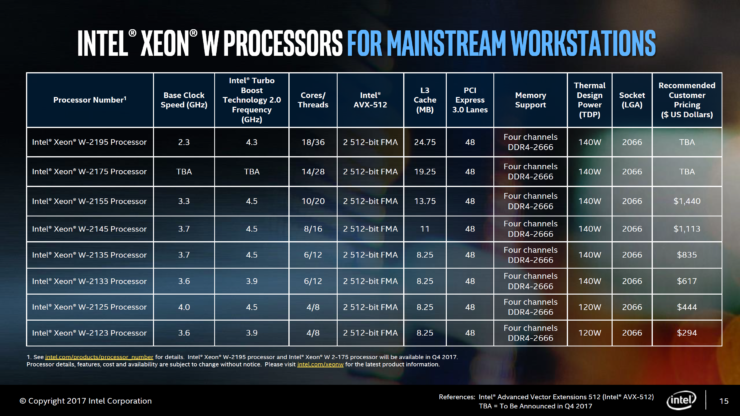 Intel has officially launched their Xeon W workstation processor lineup which will feature a broad range of SKUs aiming for the professional workload market. 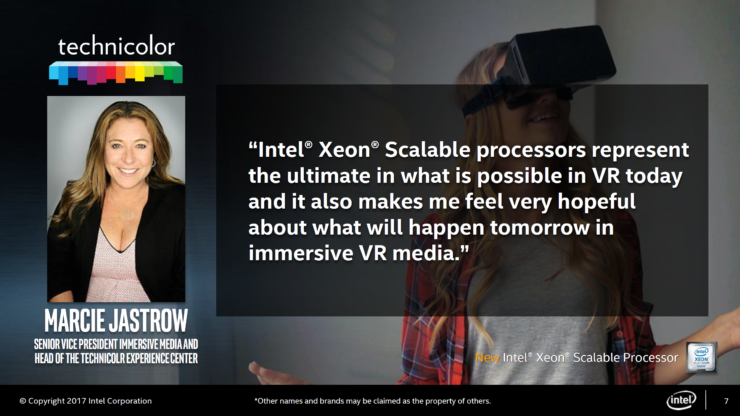 The Intel Xeon W family will come with a range of new technologies that are available on the higher end Xeon Scalable Family. 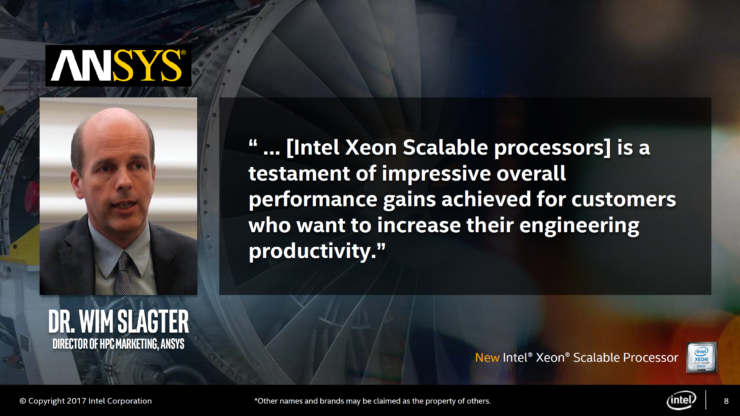 Intel had already released their Xeon Scalable Family and the only thing that was missing from that launch was a successor to the Xeon E5-1600. 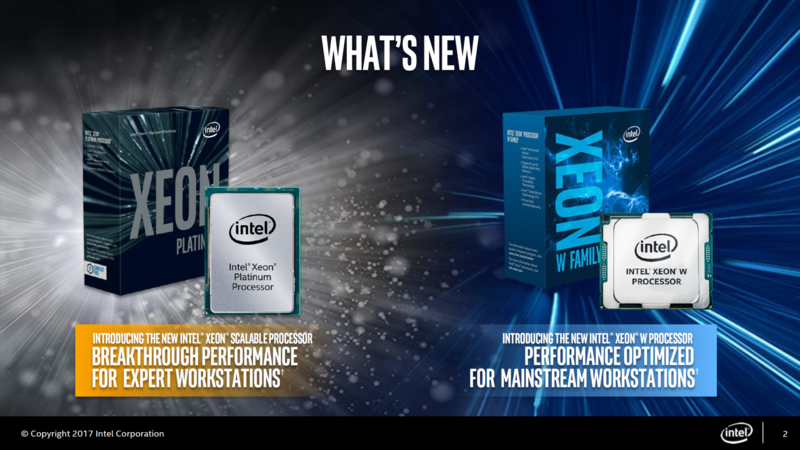 Intel has now launched a new successor to the family known as Xeon W and to our surprise, it remains loyal to socket LGA 2066 while using a new chipset called C422. 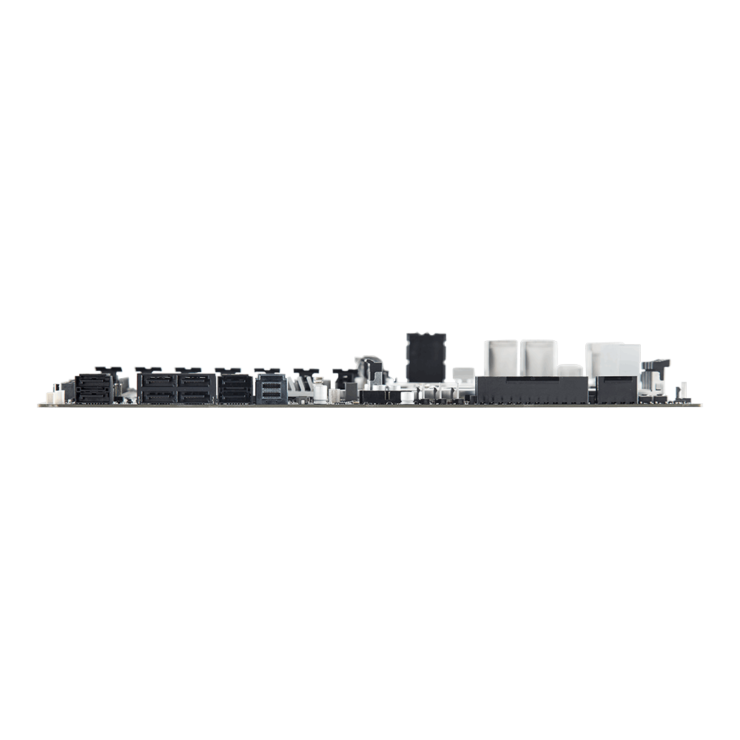 The platform comes in a single socket design so those who want higher scalabilty across multiple cores should look towards the Xeon Scalable family. 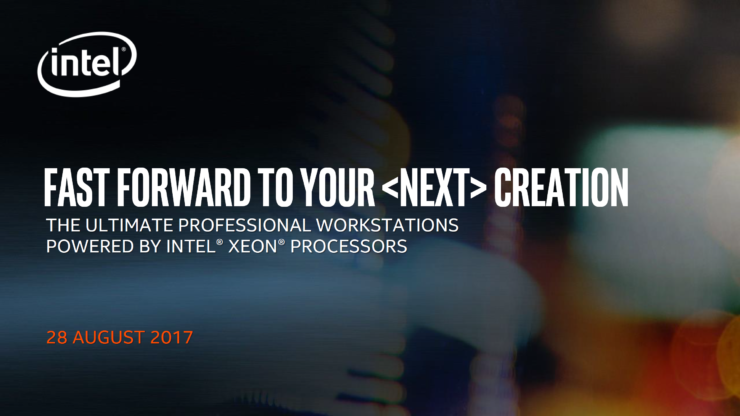 Intel Xeon Scalable processors for one- or two-socket expert workstations arm professionals with world-record compute performance, hardware-based acceleration for the widest range of workstation software applications, and low-latency, high-throughput access to storage and network resource. 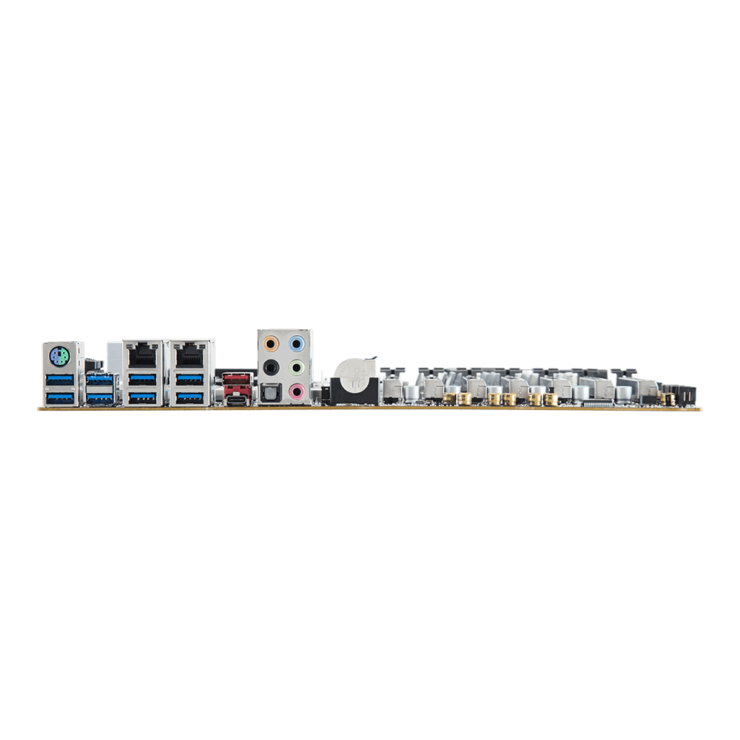 Elite workstations utilizing two Intel Xeon Scalable processors offer up to 56 cores, 77MB of last level cache, 3TB of system memory and 96 lanes of generation 3 PCI Express. 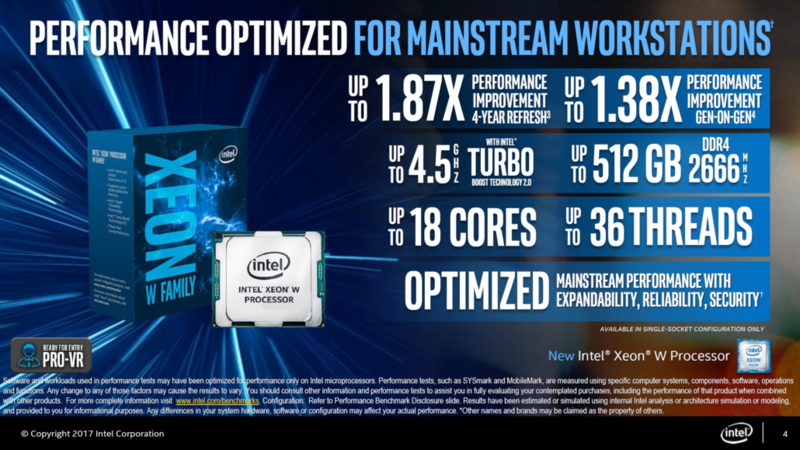 Intel Xeon W processors for advanced one-socket workstations deliver performance optimizations, enhanced memory capabilities, hardware-enhanced security, and advanced reliability features for those who need greater capabilities than those found in entry workstations. 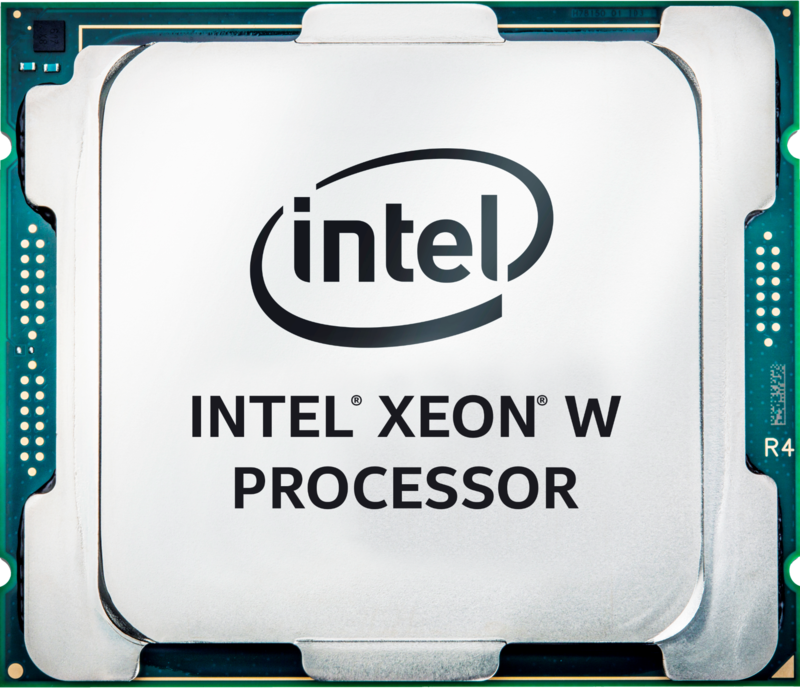 This single-socket processor with 4 to 18 cores was designed specifically for the needs of mainstream workstation professionals. 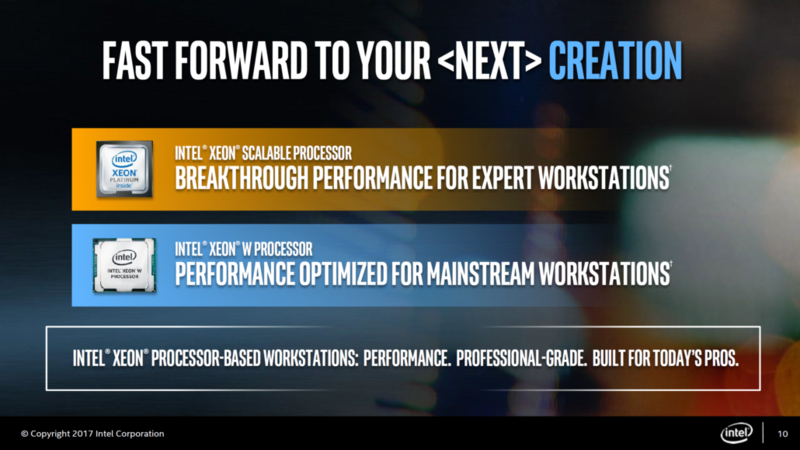 Intel is saying that the Xeon Scalable Family will be targeting the expert workstation market while the Xeon W Family will be targeting the mainstream workstation market. 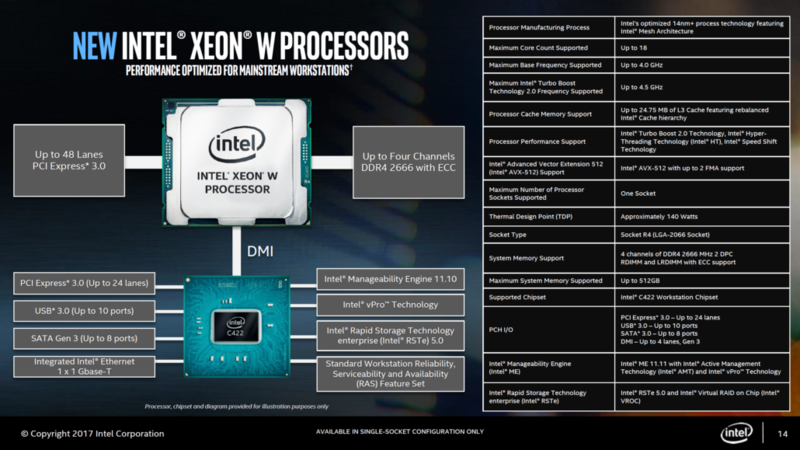 The Intel Xeon W family brings forward a broad range of features. In terms of performance, we are looking at over 1.87x improvement when coming from a four year old platform and a 1.38x performance leverage in generational comparison. The lineup consists of 8 SKUs that feature up to 18 cores with boost 2.0 speeds of up to 4.5 GHz. 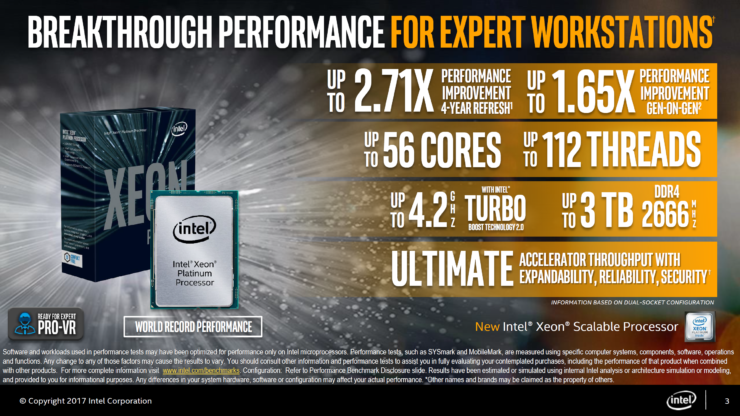 These processors are optimized for mainstream performance with true expandability, reliability and security features on board. 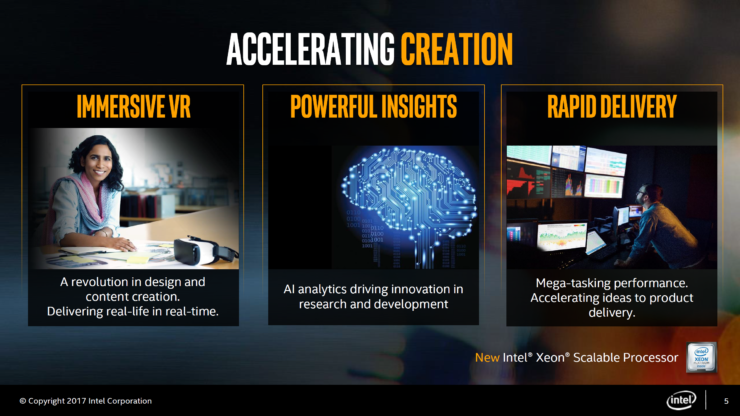 Target markets in the workstation space include VR, content creation, AI research and development and mega-tasking workloads. Intel is partnering with several vendors to deliver a high-end hardware and optimized software stack at launch. 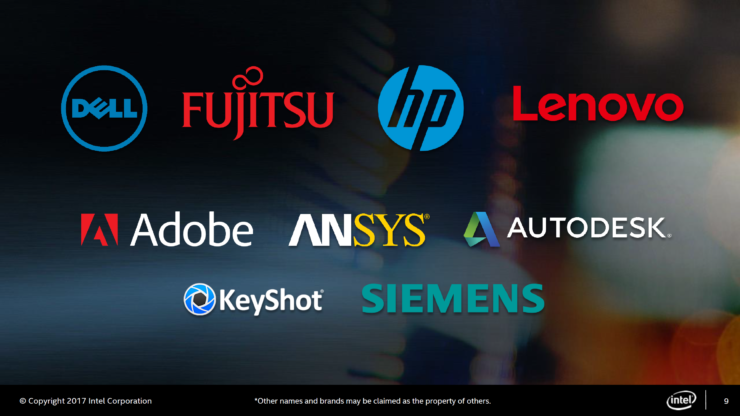 Some of these partners include Dell, HP, Lenovo, Adobe, Autodesk, etc. 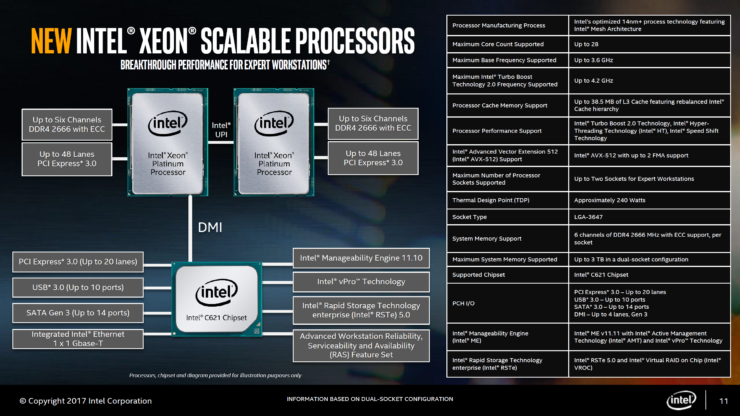 The Intel Xeon W family will be featured on the LGA 2066 socket alongside a new chipset known as Intel C422. The Intel C622 is powering the higher-end Scalable Family on the LGA 3647 Socket while the C422 will support and unlock a range of features for Xeon W on the LGA 2066 socket platforms. 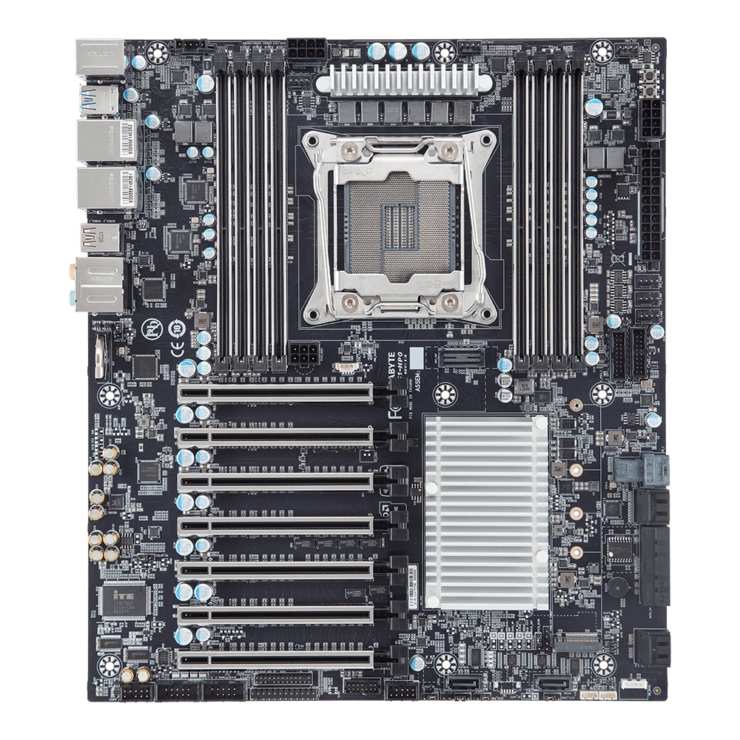 While technically similar to Intel’s X299 platform, the C422 platform unlocks a range of technology features such as DDR4-2666 ECC memory and 48 Native PCIe lanes. The processors are based on the Skylake architecture and use the 14nm+ process along with the Mesh architecture for better efficiency and interconnect between the multitudes of cores on each chip. There are up to 18 core, 36 thread SKUs that can boost up to 4.0 GHz (base) and 4.5 GHz (boost) clocks. The processors feature a maximum of 24.75 MB of L3 cache which is 1.375 MB per core. All chips are compliant with Intel’s AVX-512 and up to 2 FMA support. As detailed previously, the C422 platform only allows for a single socket and CPUs with TDPs of up to 140W. The processors can support 4 channels of DDR4-2666 MHz memory (2 DIMMs per channel) and feature up to 512 GB of RDIMM or LRDIMM memory support. The processor provides 48 native PCIe lanes which is more than the 44 on the Core i9 processors. There’s also 24 PCIe lanes coming straight from the C422 PCH. Other I/O includes 10 USB 3.0, 8 SATA III ports and DMI with up to 4 Gen 3.0 lanes. Intel is also supplying C422 with a single 10 GbE port while the Scalable Family offers dual 10 GbE ports. The lineup consists of 4, 6, 8, 10, 14, 18 core SKUs. The flagship part is the Xeon W-2195 which has 18 cores, 36 threads and clocks in at 2.3 GHz base, 4.3 GHz boost clocks. There’s 2 512-bit FMA on board which puts its AVX-512 capabilities on par with Xeon Gold and Platinum series processors. There’s 24.75 MB of L3 cache on board along with 48 PCIe lanes, four channel DDR4-2666 support, 140W TDP. Pricing is not determined yet but you can check out the full specs in the table provided below. I think the more interesting detail here is that all SKUs feature 48 PCIe lanes and it isn’t kept exclusive to the high-end series like the Core i9 processors on the X299 platform. In addition to the processors, we will soon see a range of C422 chipset motherboards from various Intel partners. 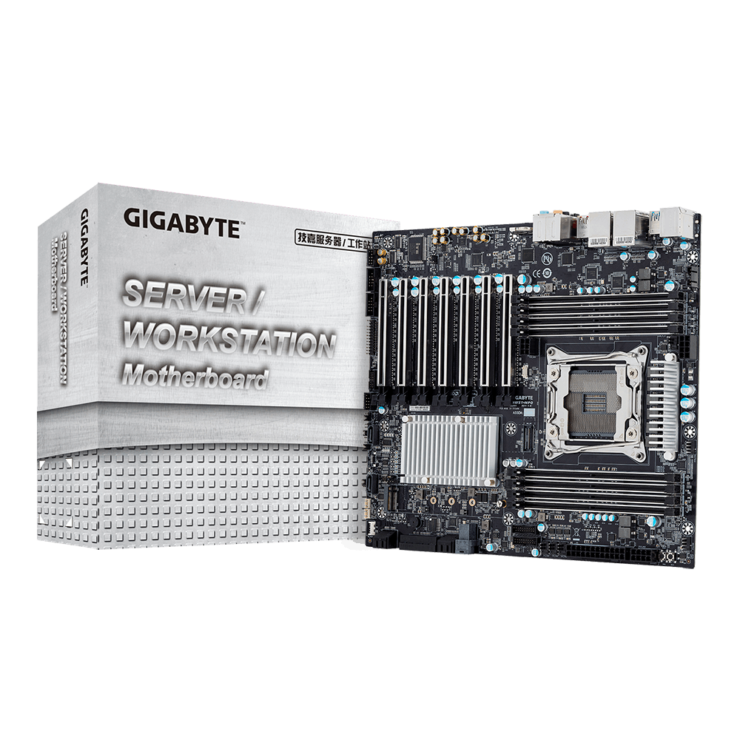 Gigabyte has unveiled their high-end workstation design that utilizes the Intel C422 chipset. 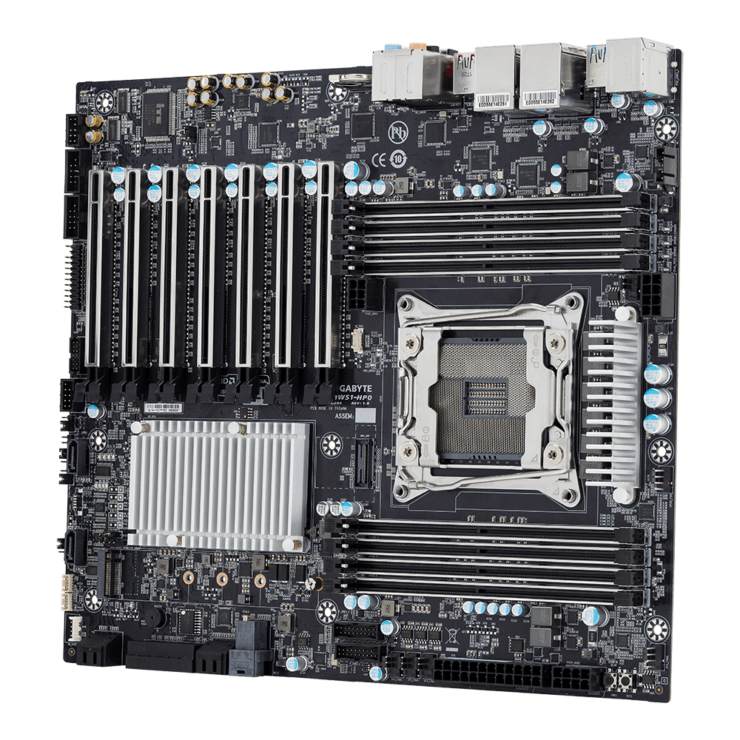 The motherboard comes with the LGA 2066 socket and features a 6+2+2 phase power delivery system that is powered by dual 8 pin connectors. The motherboard is supplied power by a 24 pin ATX connector. We are looking at an extended ATX form factor and the VRM heatsinks are all metal and nothing fancy like the X299 platform for better heat dissipation. There are eight DDR4 DIMM slots which are surrounded by metal protection which is a plus for server tier boards. In terms of expansion, the board features a whooping 7 PCIe Gen 3.0 x16 slots, all of which feature metal shielding. There’s an auxiliary 6 pin connector to feed the expansion slots with extra power if need be. There are 10 SATA III ports along with M.2 and U.2 ports to drive the latest NVMe storage devices. The motherboard is fully compatible with Intel’s VROC, has 2 GbE LAN ports (Intel I210) and four full speed Gen 3.0 x16 slots. In terms of I/O, we get 8 USB 3.0, a USB 3.1 Type-A and Type-C combo, a HD audio jack and the ever so useful PS/2 port which is a must for server level devices. There’s no word on the pricing, but expect this product to go for a premium price.